Not so long ago, three ships passed in the Met night. We probably didn’t grasp the transient nature of what was transpiring right in front of us because we didn’t know their night sharing the same waters would be over so soon. On August 9, 2012, R.A. Dickey threw a complete-game, ten-strikeout five-hitter to defeat the Marlins at Citi Field, 5-1. Not only did R.A.’s 15th win (against only three losses) halt a three-game Met slide, it marked the first time the Mets had won at home in more than a month. On August 10, 2012, the Mets’ discomfort in their own ballpark returned, as the Braves came to Queens and greeted Matt Harvey rudely. Harvey’s home debut was a far cry from his first major league start just over two weeks early. The rookie righty was behind, 2-0, after three batters, as Jason Heyward nailed him for a two-run homer. Matt lasted six and finished strong, retiring his final nine batters, but four walks in the first two innings told most of the story of the 4-0 loss. On August 11, 2012, Johan Santana was making his first start in three weeks, having been placed on the disabled list in late July with what was listed as an ankle injury but probably had a little something to do with the surgically repaired left shoulder that had kept him out of action for all of 2011. Either way, Johan didn’t look sharp after Reed Johnson of the Cubs stepped on his ankle during a play at first base on July 6, so a little rest couldn’t hurt. In this Saturday night matchup with the Braves, however, it was obvious it didn’t help. Atlanta (whose lineup now included the very same Johnson) jumped all over Santana, knocking him out in the second inning. He left trailing, 5-0; Jeremy Hefner came in with the bases loaded and immediately surrendered a grand slam to Freddie Freeman. The Mets would lose, 9-1. Fast-forward a few days later to Cincinnati. R.A. Dickey is gamesmanshipped by the Reds into removing two unobtrusive bracelets from his glove hand and loses, 6-1, on August 15. Matt Harvey finds the form that had the league buzzing upon his callup, striking out eight Reds while giving up just one run in 7⅔ innings en route to an 8-4 Mets win on August 16. Johan Santana starts the series-opener that follows the next evening in Washington and it doesn’t go nearly as well. Three perfect innings are wiped away in the fourth on three consecutive singles and the Michael Morse home run that drives in four on one swing. Johan gives up another homer in the fifth, a two-run job to Bryce Harper, before getting out of the inning by flying Morse deep to center. It’s the last pitch Johan Santana will ever throw for the New York Mets, and August 17 marks the end of the era when the Met rotation features the team’s three most storied starters of the 21st century. One story was prematurely over, another was reaching its climax and the third was just filling its first pages. The era that encompassed all three of them lasted exactly two turns, but it happened. There was a time when the Mets would send R.A. Dickey, Matt Harvey and Johan Santana out to pitch in succession. The time measured nine days in 2012. The Mets could overwhelm opponents with dazzling starpower from the mound in the more distant, less fleeting past. In 1990, for example, it wasn’t uncommon to watch consecutive games started by Frank Viola, David Cone and Dwight Gooden. In 1976, we were regularly treated to some variation of Tom Seaver, Jerry Koosman and Jon Matlack starting in succession. Down the stretch in 1969, Gil Hodges rolled out Koosman, Seaver and Nolan Ryan in a row. But the ships that passed in the 2012 night — or sailed one behind the other ever so briefly before peeling off in three distinct directions — make for an unlikely unit in hindsight. It’s not two years later and it’s hard to picture those three together. Besides, in August of 2012, we couldn’t be quite certain that those three were Those Three. Unlike the other aforementioned groupings of yore, this was not a trio of contemporaries. You had no guarantee you’d have reason to think of them as peers in the “most storied starters” sense. Today, their stories are still in flux, as they retain only one undeniable similar circumstance: the Mets are putting together a rotation for 2014 and none of them is slated to be a part of it. Funny how time picks up speed and sails away. Funny, too, how quickly the names that are etched into our collective top-of-mind can be plastered over by other names. Every March from 2008 to 2013, Johan Santana was the first pitching name we thought about, either because we were thrilled he was here or were worried that he wasn’t. Now, after an uncomfortably uncertain pause, we know for sure that Johan is in camp…but not ours. He signed a minor league deal with the Orioles the other day. He’s confident he’ll be back in pitching trim soon enough, ready to help his team at some point this season. We used to hear him offer those kinds of resolute projections, cross our fingers and hope for the best. I suspect we still hope for the best where Johan Santana is concerned, but his seemingly endless comeback trail winds through Sarasota, not St. Lucie. His salvation may be somebody else’s solution eventually, but right now, his status is somebody else’s problem. We didn’t think about R.A. Dickey at all in the first March he flitted across our radar. In 2010, he was, as he likes to tell it, the first cut in Spring Training. Indeed, he and Josh Thole were reassigned to the minor league side of the Mets’ complex on March 15 that year, having been given all of five innings to impress Jerry Manuel. The journeyman and his knuckleball didn’t make much of an impression: nine hits, three walks, five earned runs. Two months later, he was called up from Buffalo. Two years later, he was crafting the best season by any pitcher in the National League and the best story by any player in the known universe. Then having literally and figuratively scaled every mountain available to him, the man who morphed into the undisputed Met ace once Santana was no longer physically able to maintain that mantle was traded to Toronto. This past week, as Johan was attempting to take flight as an Oriole, R.A. was up the coast in Clearwater loosening his wing for the Blue Jays. He gave up a home run to the Phillies’ Marlon Byrd but was in no danger of being shuffled off to Buffalo. Jays manager John Gibbons has already named the fully proven veteran his Opening Day starter. Harvey was sent down on March 16, but was converting agnostics into believers in his very first major league start on July 27, fanning eleven Diamondbacks in Phoenix and setting the stage for two intensely promising months of pitching. The only reason he wasn’t the biggest story of the back half of the 2012 season was Dickey had taken off into the stratosphere, chasing and notching a 20th win and earning a Cy Young. Dickey’s ascension was also the best reason we didn’t miss Santana quite so much as August turned to September. Likewise, Harvey’s subsequent rocket ride to all-world prominence explained why, despite the justified Sturm und Drang surrounding Dickey’s trade, R.A.’s absence wasn’t mourned quite as much as it might have been in 2013. That’s the idea: a triple-helping of special, Harvey, Wheeler, Syndergaard, perhaps all in a row. Like when the Mets could string together trios of starts from the youthful and the accomplished. They have the youth. They just need the accomplishments. And uninterrupted health. Santana had the accomplishments before coming to the Mets and racked up a few more during his New York tenure, one in particular that will live for as long as there is a Mets franchise (and another that nobody who saw it will ever forget). But he had only intermittent health. Dickey’s most admirable accomplishment pre-Met was professional survival. Then he came here and became an icon, captivating us whenever he spoke and dominating batters whenever he threw. Then he was gone in a transaction that we might not readily identify under his name in a couple of years. That left Harvey, who turned out, in a distressingly limited sample size, to be at least as good as either of his erstwhile rotationmates ever were as Mets. We assume Harvey Days will be bountiful again come 2015 (if not sooner…though probably not sooner). We assume that, because to imagine anything else would undercut our trio of dreams and be just too goddamn cruel to fathom. We didn’t assume after that second turn through the rotation that went Dickey to Harvey to Santana that we’d never see Johan pitch for us again and we sure as hell had no idea only nine starts remained in R.A.’s Met career. We’d only recently come to understand how special it was to have the two of them burnishing their legends on a back-to-back basis. Then Matt was dropped in between them and there was no time in real time to comprehend just what we were seeing. The idea was never quite Santana, Dickey and Harvey. It just kind of happened that way. Then, without warning, it wasn’t happening at all. That’s OK, though. Something seems to be happening here. We’ll just have to keep one eye on the horizon and try to figure out what it’s going to be. 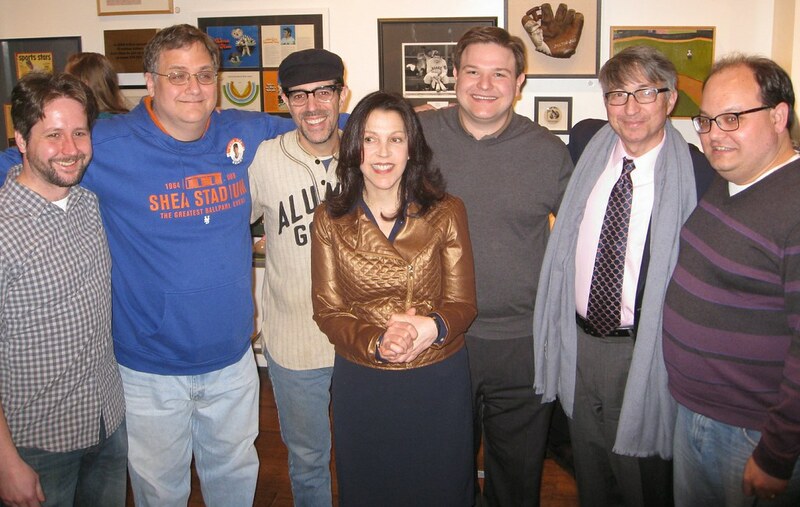 My thanks to Annie Levy and the Photo ID Foundation for inviting me to take part in the Baseball As Good Medicine evening of storytelling Thursday night and thanks, as ever, to Jay Goldberg for his superlative hosting at the Bergino Baseball Clubhouse, a shrine each and every one of you should visit. Hat tip as well to my fellow storytellers, including Mets fan Paul Lukas, who not only knows how to wear a uniform but exchange a rain check. Assuming you mean Martinez and not Astacio, I’ve got Pedro as fourth most storied Mets starter (that is fourth-most storied Mets starting career) of the current century. We who are so inclined will remember him extremely fondly but I don’t have the sense we’ll sit around the electronic campfire and swap “that time…” or “that game…” stories about Pedro the Met as we will the other three as time goes by — and that’s said while acknowledging Harveysteria’s been put on hold. A sublime 2005, a significant first half of 2006 and an undeniable Sheawide chemical reaction to his his most every appearance notwithstanding, his Met legacy grows unfortunately vague in the shadow of the injuries that ultimately limited his outsize presence. I thought about writing “…give or take Pedro Martinez,” but I didn’t cotton to clouding the narrative. Nevertheless, consider those my 1,974th through 1,978th words on the subject. OK, Once Bitten, followed by Ships passing in the night…obvious Ian Hunter theme going on…next is Cleveland Rocks? Or are Wheeler and Thor the Young Dudes? I was thinking Barry Manilow haha. Johan’s Mets legacy is a unique one. If not for those two signature games, there’s no doubt he’d be remembered with a “what might have been” sigh, but the last Saturday of 2008 and of course the no-no cemented him into Mets lore forever more. Two stirring and memorable complete game victories, which elevates him to a level above those guys who’ll always be remembered for that “one thing” they did, like Todd Pratt, Bobby Jones and Endy Chavez. And the two games were years apart, which separates him from guys like Al Weis, George Stone and Timo Perez, the ones who lit up at the ideal time then faded (in Timo’s case a tad prematurely unfortunately for us). As far as Pedro goes, I think we truly appreciated his heart and there was never any sense that he was giving anything less than his all, but the injuries really prevented him from hitting the high notes during his Mets tenure. Too bad he never had one of those defining-type games as a Met, such a shame. I’m just thinking of our first round of storied starters which included the likes of Seaver, Koozman, Gentry, Ryan, Matlack, McAndrew and what our next potential trio is going to share with them – no run support. Our early seventies clubs count not muster more than 83 wins in any one season despite having the top pitching and one of the top defenses in the league. With only three established hitters in the lineup there has been little effort the past two off-seasons to secure more bats since we do not have the hitting talent anywhere yet ready in the minors. Curtis Granderson replaces Byrd in the lineup and Johann in the payroll. Chris Young, over the past three years has hit the Manhattan area code with a .680 OPS against right handed pitching and is not the answer except against left handers. And CY will not be on the team past this season in any event. Today Lagares demonstrated why he is valuable playing center. We need those other hitters simply so his weak bat can be compensated in the lineup which helps our pitching staff even more. Wonder if having a payroll lower than the Kansas City Royals has anything to do with this? I did notice that we had a veritable changing of the guard in place. On the one hand, the 1983 Mets had Seaver, Staub, R. Hodges, and Kingman: veterans of 1969/1970s glory days. On the other, you had part of the 1986 core in place, in Strawberry, Hernandez, Backman, Wilson, Orosco, Heep, Sisk, and maybe one or two others who had cups of coffee (Darling). Sometimes, as you note, you have momentous things going on right in front of you without noticing. Hopefully, 2014 will be similar to 1983. Or better. A reflection on that aspect of 1983 here.